Biotechnology has impacted the textiles industry through the development of more efficient and environmentally friendly manufacturing processes, as well as enabling the design of improved textile materials. This book will provide a thorough overview of current and future focuses of biotechnology in the fibre and textile industry. 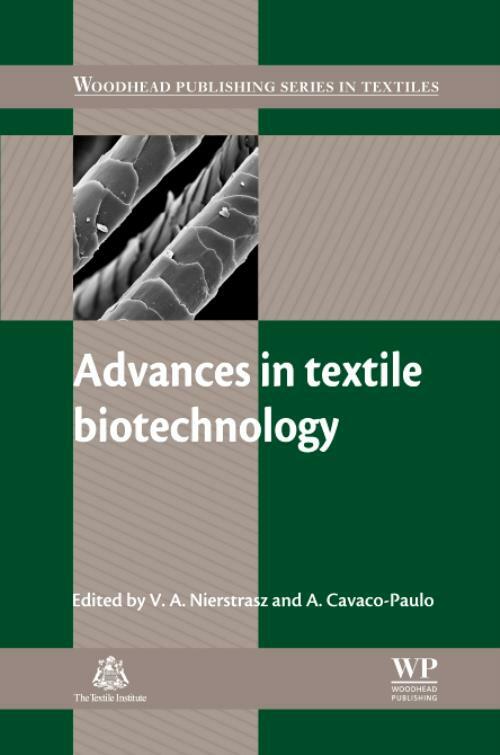 Part one of the book opens with a review of technologies involved in textile biotechnology. Chapters explore the design and engineering of novel enzymes for textile applications and developments in processes and equipment for enzymatic textile treatments. Part two investigates the modification of particular fibres through the use of biotechnology. Key topics include the treatment of wool and silk fibres and the enzymatic treatment versus conventional processing of cotton. With expert contributions from leaders in their fields, Advances in textile biotechnology is a comprehensive guide for those in the textile and fibre industry, as well as experts in the biology, chemical and environmental engineering industries. Part 1 Technologies involved in textile biotechnology: Design and engineering of novel enzymes for textile applications; Developments in processes and equipment for enzymatic textile treatments; Smart textiles and biomaterials containing enzymes or enzyme substrates. Part 2 Modification of particular fibres through the use of biotechnology: Enzymatic hydrolysis and modification of core polymer fibres for textile and other applications; Enzymatic modification of polyacrylonitrile and cellulose acetate fibres for textile and other applications; Enzymatic treatment versus conventional chemical processing of cotton; Engineering of plants for improved fibre qualities; Enzymatic treatment of wool and silk fibres; Functionalisation of wool and silk fibres using non-proteolytic enzymes; Developments in recombinant silk and other elastic protein fibres for textile and other applications; Enzymatic functionalization of cellulosic fibres for textile and other applications: Xyloglucan as a molecular anchor; Developments in the processing of chitin, chitosan and bacterial cellulose; Hydrolysis of regenerated cellulose fibres for textile and other applications. Nierstrasz, VDr Vincent Nierstrasz is Senior Scientist at the Department of Textiles at Ghent University. His research focuses on biotechnological surface modification and functionalisation of textile (bio) polymers. He has expertise and experience in research, development and innovations in textile and polymer biotechnology. Cavaco-Paulo, AArtur Cavaco-Paulo graduated from the University of Lisbon with his first degree. He then went on to take his Msc and PhD at the University of Minho where he is now Professor.